We provide testing services to assist any dairyman or veterinarian in maintaining or reaching their goals. We look forward to supplying you with excellent service and quality results. 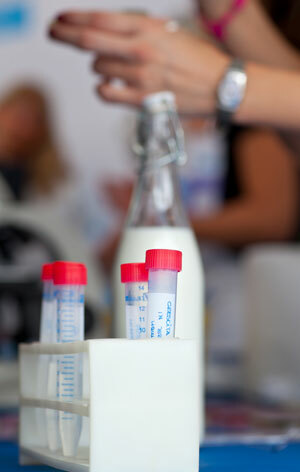 for your milk and feed/forage testing. We provide services to assist any dairyman or veterinarian in maintaining or reaching their goals. We look forward to supplying you with excellent service and quality results. Why is feed testing important? Quality can vary greatly among and even within fields. Conducting a nutritional laboratory analysis on hay and/or silage sample is the best way for producers to evaluate the nutrient content of the feedstuffs. When you partner that information with the nutrient requirements of the animals being fed, we know it will help to develop a better a feeding program. Isn’t all the milk the same? No, all milk isn’t the same. In fact, milk is one of the most highly regulated and tested foods you can buy. It is tested for safety 2-3 times before it moves on the grocery store. Here are ADM, we want to ensure that everything that you need tested is done properly and with fast results. Our facility is open for you to see at any time. Feel free to stop and one of us on the ADM team will show you around. We are located a mile north of Walmart at 5346 N Prince Street. by our facility any time. We’d be happy to show you around. Feel free to call us at 575-763-0039 or toll free at 877-236-5227. We are happy to answer your call and give you piece of mind when it comes to laboratory testing.